Property 1: Best Choice To Visit Nyc!! Just One Bus Stop Away From Times Square!!! Lovely 1, 2, or 3 Bedroom Home 30 Minutes To NYC. Property 11: Lovely 1, 2, or 3 Bedroom Home 30 Minutes To NYC. Modern and comfortable apartment, 20 minutes to New York. Property 20: Modern and comfortable apartment, 20 minutes to New York. Property 32: NYC SKYLINE VIEWS AND BACKYARD WITH SHORT COMMUTE! SUNNY 3BR/2BA APT **MIN TO NYC** SLEEPS 10!!! 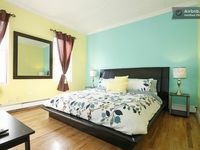 Property 34: SUNNY 3BR/2BA APT **MIN TO NYC** SLEEPS 10!!! Property 40: 1817 5A · Magical 2bed Apt/20 min to NYC-Parking Avail. 1817 5F · Marvelous 2bed Apt-20 min to NYC/parking Avail. 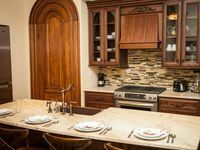 Property 41: 1817 5F · Marvelous 2bed Apt-20 min to NYC/parking Avail. Property 42: Affordable luxury Apt, 7 min walk to 24/7 metro stop, 1 min walk to Supermarket! This was one of the best homes we have ever stayed in. I wish my own home was as beautiful. It was very easy to get into the city, and groceries and such were very close by. We will def. be returning. The apartment was cute and had everything we would need for our 3 night stay. The bed was super comfortable. Ruth is awesome! Very easy to communicate with. She responded to texts and calls almost immediately. I was nervous about parking and getting around that area, but she provided great detail that eased all my anxiety. It was the easiest in and out of NYC I&rsquo;ve ever experienced. There are shuttle busses that pick you up right outside the apartment and drive you right into NYC. The busses come so frequently that we never even ended up waiting for one and it was also only $3.25 each way. We would definitely stay here again!